Below the magnificent snowy peaks of the Hindu Kush lies the green meadows and clear lakes of the beautiful Swat Valley in the Khyber-Paktunkhwa Province of Pakistan. In the summer of 2010, this lush and picturesque valley was devastated by massive floods, killing over 1500 and leaving over 4 million homeless.The United States military brought in relief supplies and helped with evacuation. 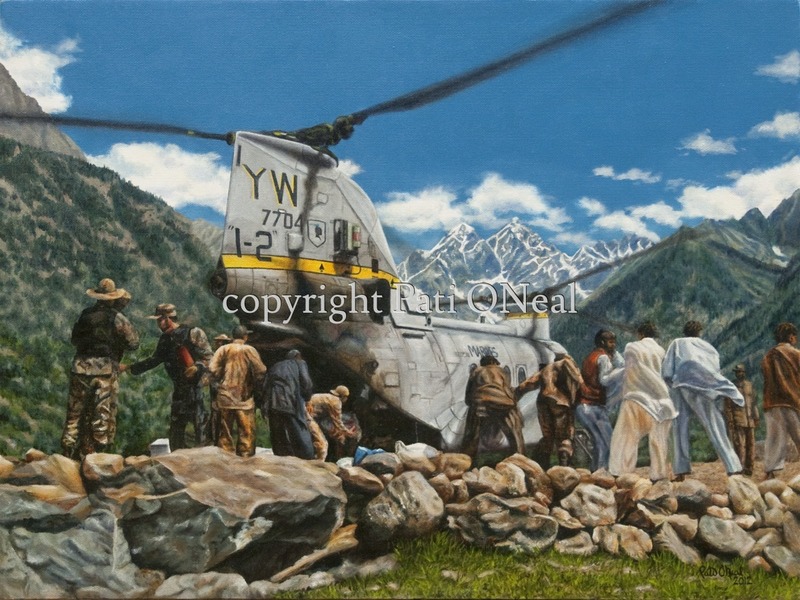 This painting shows a Marine Corps Sea Knight (CH-46E) helicopter from HMM-165 (REIN) getting unloaded. It is based on an snapshot taken by my nephew, Marine Capt. Matt Wesenberg, a pilot with the 15th Marine Expeditionary Unit, HMM-165 (REIN) while flying this mission. Framed original oil on canvas available, contact the artist for purchase information. Limited edition giclées and open edition matted mini-prints also available.